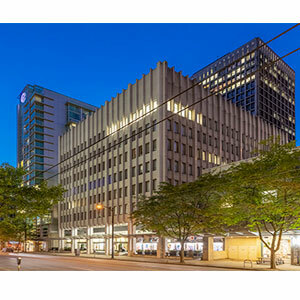 The seven-storey, 83,068-square-foot Shorehill Building was acquired by the Vancouver-based property management, real estate investment and purpose-built rental development company for an undisclosed price in an off-market transaction. The Shorehill Building is 95 per cent occupied, with a mixture of short- and medium-term leases. Anchor tenants The Continuing Legal Education Society of British Columbia and Bazinga Technologies Inc. occupy full floor plates. The Shorehill Building was built in 1967 and renovated in 1993, and Hollyburn will make further improvements. “Upgrades to common areas, elevators, the exterior street front and lobby are all in the planning stages” to add value and make leasing more attractive, according to Wasel. Vancouver’s existing apartment stock is becoming dated and maintenance-heavy, so Hollyburn is looking to diversify its portfolio. With the city’s office vacancy rate sitting below five per cent, the sector offers promise. “Hollyburn owns and manages 50 CRUs (commercial retail units) in seven properties across Canada already, much of which is street-front retail, and has consciously made efforts to diversify its asset bases to include more commercial real estate asset classes, such as office properties,” said Wasel. Hollyburn sold a residential property at 1650 Alberni St., which also houses its head office, to Landa Global in April. A lease-back arrangement will allow Hollyburn to stay there until it moves into its new space, which will have an 11,400-square-foot floorplate and 12-foot ceilings. Hollyburn submitted a rezoning application for 276 purpose-built rental units at 1650 Alberni St. However, when it couldn’t reach an agreement with the City of Vancouver on what community amenity contributions the rental project could afford to pay, it realized the highest value use for the property would be to redevelop it as a luxury condominium. Since Hollyburn is in the purpose-built rental business, not the condo business, it sold the property after receiving interest from half-a-dozen bidders. The downtown Shorehill Building site is more centrally located than 1650 Alberni St., which is in the Coal Harbour neighbourhood, and offers easy access to public transportation, restaurants, shops and almost 30 Hollyburn apartment communities. It has a Walk Score of 97 and a Transit Score of 100. Wasel also believes the Shorehill Building site, which includes more than 60 parking stalls, has long-term redevelopment potential. Hollyburn manages and operates 90 rental communities, with more than 5,600 suites, in Vancouver, Calgary, Toronto and Ottawa. It recently acquired an apartment at 38 Lawton Ave. in Toronto for $19.1 million and another at 535 13th Ave. S.W. in Calgary for $11.9 million from insurance and financial services company Industrial Alliance (see Hollyburn acquires Toronto, Calgary apartment buildings).